STANDARD SIZE:11.25" X 4.3" X 9"
LARGE SIZE:14" X 5.5" X 12". MATERIAL: high-qualty oxford nylon fabric with fabric linging, strudy, lightweight, durable and waterproof. Pockets with CLASSIC ZIPPERS, smooth and easy to open and close. Standard Size Structure: 1 main zip compartment, 3 front bag, 1 back bag, 2 beside pocket. Function: handbag, shoulder bag ,carry all,pocketbooks and cross-body bag The details decides the quality. High quality hardware + No pilling straps + smooth zipper. Let you become the focus of the crowd. GIFT IDEAL: It is one of the most special gifts for mom girlfriend,mother,Birthday,Thanksgiving Day, Anniversaries, Mother's Day, Christmas,St. Valentine's Day,New Year's Day and other Special Occasions. The Shoulder Bag is a charming handbag for casual outings. This modern design is well equipped with organized storage, plenty of room for your cell phone, wallet, makeup and toiletries with more than enough space for virtually any standard tablet. The soft yet sturdy design allows this versatile bag to fit nearly anywhere you need to temporarily stow it, out of sight, but near at hand. It's hard to find purses and handbags that are both roomy and gorgeous at reasonable prices. 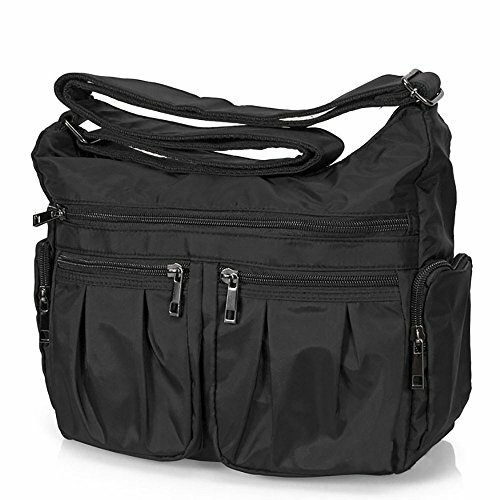 When your life is active, you need a large, chic shoulder bag with lots of pockets. Fashionable, affordable and convenient, you'll want one in every color! The handbag color may vary slightly from the online image due to monitor color settings. 8 pockets with Classic zippers, smooth and easy to open and close. Standard Size:11.25'' X 4.3'' X 9''. Large Size:14'' X 5.5'' X 12''. large capacity for your convenience; adjustable shoulder strap. Super practical: Made of practical water resistant and stain resistant nylon fabric that is durable lightweight high quality construction, easy to care for wipe clean or machine wash It is big capacity. There are 1 main bag, 3 front bag, 1 back bag, 2 beside pockets,1 inside pocket,2 inside card and phone holder. You can take all your things with you. Every day and travel crossbody bag:Fashionable style, can be used as a handbag, shoulder bag or cross-body bag.with a variety of storage options & organization features, ideal for travel, errands, shopping, and diaper bag for parents on the go.